Somber salutations Nosh Show Listeners. There is no review today, just a picture of this glorious looking thing that Carvel has put out. I envision eating it like a giant ice cream sandwich. I can't imagine it not being delightful to eat. I kind of don't want to go back and buy it for fear it won't live up to expectations. Just like Episode 101, I don't want reality to make me sad. 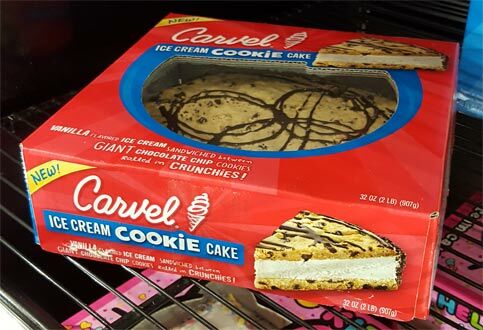 The Carvel Ice Cream Cookie Cake is vanilla flavored ice cream sandwiched between giant chocolate chip cookies rolled in crunchies. Yes, it's a giant chipwich (or chips galore for all you blue bunny fans). Would you buy this glorious thing? Would you share it? Price is $16.99. As for the sadness of episode 101, I fear that our good bud Junk Food Guy is taking a break from podcasting as he prepares for the next phase of his life. I wish him the best and hope that one day he has the chance to pick up the mic again (or at least still do radio sometimes!). What store did you find this glorious creation? Seen at Wegmans and Market Basket so far, but should pop up where Carvel cakes are sold. I sent you a picture of it from stop and shop, so it's obviously there too! Thanks for keeping things going - and to JFG, all the best! @Deb: yeah, I meant to check your email before I responded to the other commenter but I was in a hurry. Wait so has someone tried this or not? Been drooling since seeing it in my walmart neighborhood market last night and need to know if it's worth the $20 and calories!